DETROIT -- Buick is creating a subbrand called Avenir to take advantage of consumers’ growing appetite for high-end touches. Avenir will be Buick’s equivalent of Denali at the GMC brand. It will include larger wheels, a unique grille and premium trim features, among other upgrades. “Through the first half of 2016, Buick has been the industry’s fastest-growing major international brand, and Avenir is key to future growth and delivering on the high expectations of new customers coming to our showrooms,” Duncan Aldred, Buick’s vice president of global sales, service and marketing, said in a statement today. Buick officials said changes in the brand’s demographics make the timing right for such an offering. The average age of its buyers is on the decline, it has made significant inroads with women, and half of customers now come from competitive brands. Buick clearly believes there’s room to push transaction prices higher, noting that 90 percent of people who buy its most expensive vehicle, the Enclave crossover, choose one of the top two trim levels. 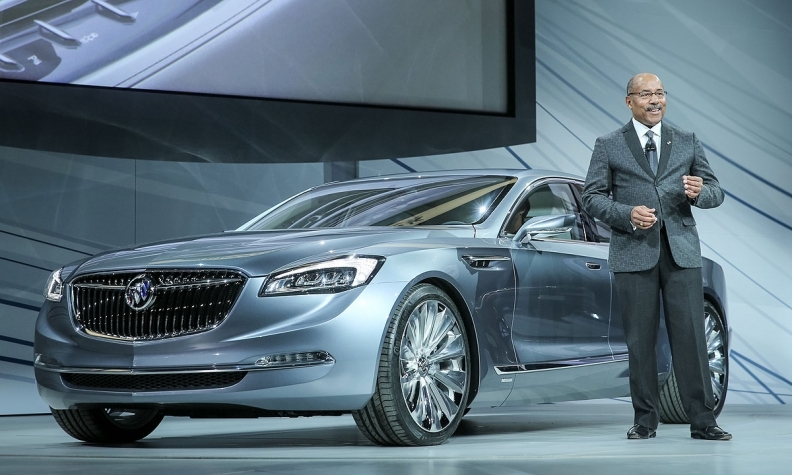 Now-retired GM design chief Ed Welburn with the Buick Avenir concept on the eve of media previews for the 2015 Detroit auto show. Avenir -- a French word meaning “future” -- was the name given to a flagship sedan concept displayed at the 2015 Detroit auto show. Styling cues from the Avenir were incorporated into the redesigned LaCrosse sedan that went on sale in August. Buick is borrowing the three-dimensional mesh grille from another well-liked concept, the Avista coupe unveiled in January, to make Avenir vehicles stand out. General Motors has offered Denali versions of GMC vehicles since the 1999 model year. GMC says 25 percent of its U.S. sales are Denalis, which have sticker prices about $3,000 U.S. to $8,000 U.S. more than the next-highest trim, depending on the vehicle. Buick said it would provide more details about Avenir pricing and products later.